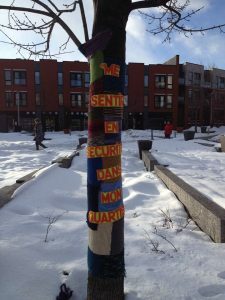 L’Anonyme is the Tandem program representative for the borough of Mercier-Hochelaga-Maisonneuve. Through different interventions, this urban security and crime prevention program contributes to increasing the sense of personal and collective security. 1. Property Safety: prevention of burglary, prevention of bicycle theft, etc. – Children and young people : safety in the street, safety on the Internet, bullying, media violence, etc. – Adults : Internet security, fraud prevention, intimidation, etc. 3. Community Safety : explorative walks, analysis of safety in public spaces, etc.